Launch Octopus resides deep underwater, where many deep sea robots will block your path. 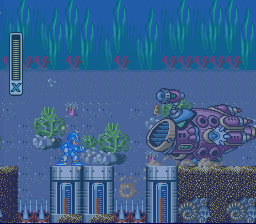 The stage features four sub-bosses as well as a heart tank (which requires a bit of extra work to get to). 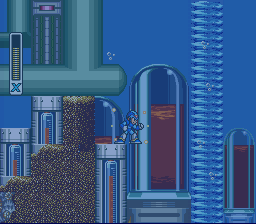 Like many other Mega Man games, X jumps much higher underwater than he does on the ground, so you can leap to great heights and lengths once you jump (or dash jump). 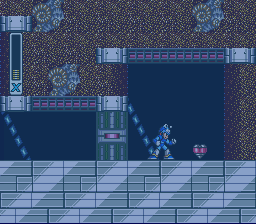 Because of this, the stage is fairly simple, however the only real obstacles are the miniboss fights and the various pits of spikes. Be careful when jumping long distances. Be careful of the seahorses. 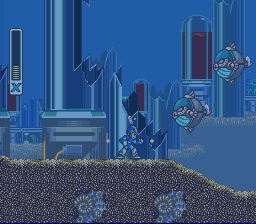 Proceed forwards and you'll encounter a frog-like robot; destroy it and keep going, where you'll encounter a large missile-shooting robot (like the one from Spark Mandrill's stage). 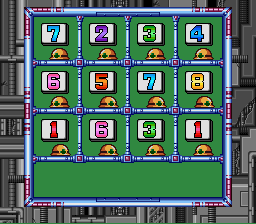 Obliterate it and keep going, where you'll encounter three more frog-like robots and one more missile-shooting 'bot. 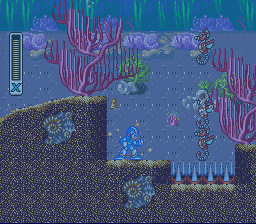 Once you get farther down the stage, some seahorse robots will rise up in pairs and try to smash into you. You can easily spot them by seeing bubbles rising up from the ground: this means they're about to come out, so be prepared. You don't have to destroy them, as you can easily jump over them. It's even possible to dash jump from the top of the cliff from before and skip about two or three groups! The first sub-boss, rather simple. This sub-boss should be easy, as he only has two basic attacks: it'll either shoot four serpent-like harpoons at you, or attempt to crash into you by dragging you towards him. 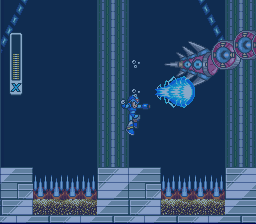 You can shoot the harpoons down with a well-charged shot, and you can counter the current by simply jumping straight into the air until it stops. It should go down fairly quickly with a series of fully-charged buster shots. 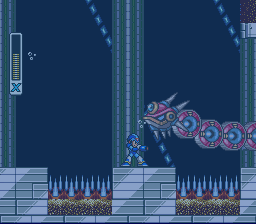 The second sub-boss: watch out for the spikes! After the first sub-boss, you'll have to deal with some annoying Gulpfers . They'll attempt to swallow you by sucking you into their mouths; if you are sucked in, just keep shooting until they're gone. Now you have to fight a second search bot, but this time there will be spikes below X which will result in an instant death if you come into contact with them. Use the same strategy from before on this search bot to quickly destroy him. Proceed forwards and you'll notice two large whirlpools. Jump into the second one, and when you get to the top, jump onto the green ship that's on the surface. 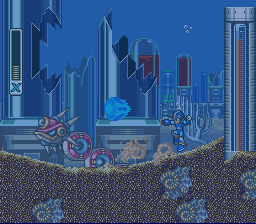 Destroy the blue orb that's on the ship until it finally goes down (some annoying grabber bots will make your life harder, so destroy them if they get near you). 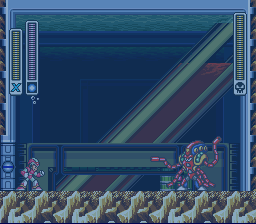 The ship will then create a passage to an underground area: go in and prepare to fight the third sub-boss, a large snake robot called Utuboros. His only weak spots are his head and tail, so aim for those. He's very easy to dodge, but hits very hard, so try your best to avoid him. 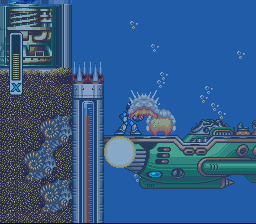 After the Utuboros is destroyed, go to the right, grab the Heart Tank, and then scale the wall next to the destroyed ship to make it back to the ocean floor. This is the whirlpool that leads to the ship. ...then jump onto the green ship and destroy the blue orb. Once you destroy it, the ship will reveal a passage. Fight the Utuboros: its weaknesses are its head and tail. Once he's gone, pick up the Heart Tank and proceed back to the surface. That's right: another Utuboros. 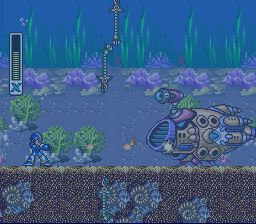 This one is different than the one guarding the Heart Tank, however, as he can go underground and then back out again. You'll know when he's coming out by the dust clouds that emerge from the ground, so avoid these areas. If you have Storm Tornado, use it here. Two well timed hits bring it down. Another alternative is to go all the way to the right and climb to the top of the column, there it will go to you and circle around without touching you allowing you to kill it easily. 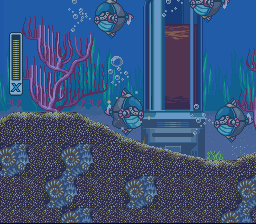 Keep going once he's dead and you'll encounter some more puffer fish. After that is the dungeon entrance, so step inside to fight Launch Octopus. ...and remember to keep shooting if you get stuck inside! 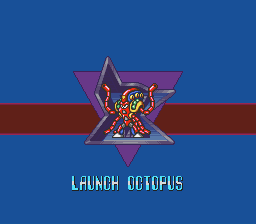 Launch Octopus can be somewhat annoying, as he can leech your health and shoot a barrage of homing missiles and torpedoes at you. However, his weakness, the Rolling Shield, can be quite effective against him. 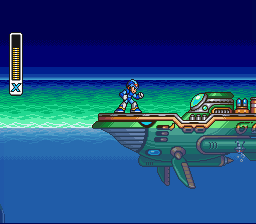 He'll start off the fight by shooting his homing missiles; either dodge them or shoot the rolling shield at them, which should destroy all of the ones coming towards you. After he shoots them, he leaves himself open, so use this opportunity to shoot one of the shields at him. Next, he'll either do his typhoon attack or shoot more projectiles at you; to get out of his typhoon, just keep dashing in the opposite direction. If you get caught in it, he'll leech your health, which is rather annoying. Either way, he always leaves himself open after either of these two attacks, so use that time to bring his health down. If you have the Boomerang Cutter, three hits will cut off his tentacles, stripping him of his life absorbing technique. Homing Torpedo! 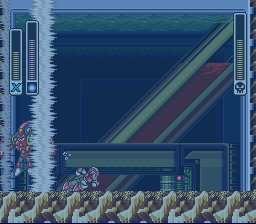 This fires a homing missile at enemies, which will search for an enemy and explode on contact. If it does not find a target, it will simply disappear off-screen. Two of these can be fired in rapid succession. 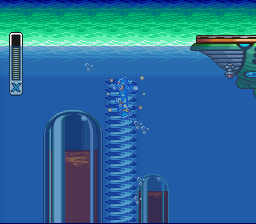 Defeating Launch Octopus causes water to show up on Sting Chameleons stage, allowing you to get the heart tank hidden below the cave. This page was last edited on 11 May 2018, at 07:49. This page has been accessed 169,186 times.